Home / Columnists/ Our tryst with mosquitoes! This small specie – small in size but quite big in impact – is creating havoc among us these days. 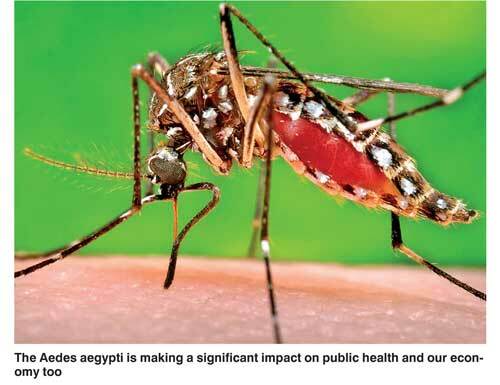 The Government has a serious emergency at hand consequent to mosquito bites and specifically the bites of one species – Aedes aegypti – making a significant impact on public health and our economy too. Aedes aegypti is the vector that carries the dengue virus and the whole reason for today’s emergency situation. We are the primary host of the virus and we appear to be playing the perfect host role and at times paying the supreme prize of loss of life, aided and abetted by the microclimate and our own ill-discipline and irresponsibility. Dengue patient numbers have reached the dizzying figures of 64,000 in six months, with more than 200 deaths. Of all species of the animal kingdom, the species that have caused most misery to human beings are mosquitoes and we are still counting the impact. From malaria to dengue the tiny blood-sucking insect is continuing to cause misery and death to date. Sri Lanka today is in the midst of a dengue epidemic with the Government declaring action on multiple fronts. Though malaria may still affect people globally, it is dengue that is showing the most significant rise in prevalence. First the climate aspect. A recent article in Nature quoted by the Washington Post indicated the concept of climate departure. Using temperature data from 1860 to 2005 as a baseline, climate departure describes the point in time that the average temperature of the coolest year after 2005 becomes warmer than the historic average temperature of the hottest year for a specific location. 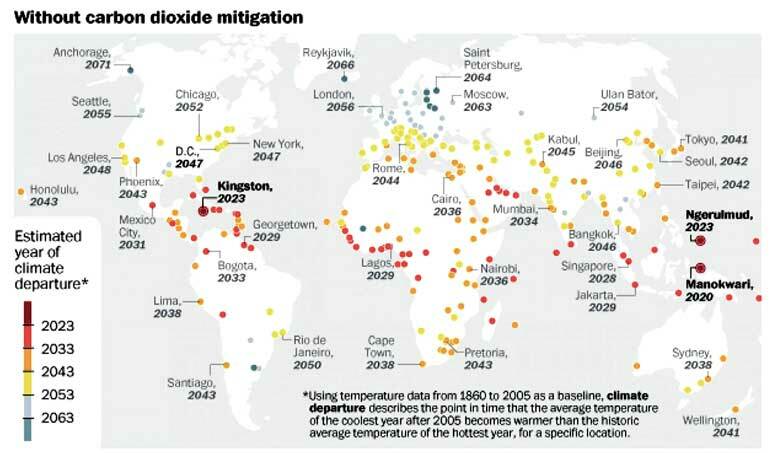 As the figure shows, for Sri Lanka we may experience that around 2023 if the word fails to support the Paris Accord and take carbon mitigation action. It is important to understand and factor the knowledge into planning and design that rising temperatures and extreme weather events which really results from climate change – I must place on record that there are plenty of climate sceptics too where some in fact consider trying to reduce carbon dioxide concentrations as a genocide against plant life! – have significant and predominant negative impact on our environment, health and perhaps our very existence on this planet. Research data from Mexico indicated that higher minimum temperatures increase dengue cases and today this favourable microclimate supporting the dengue spread is known. With theory and predictions such as climate disruption, we really have to brace ourselves to this fact and the only way for us is be prepared and be innovative in our approach. Praying for a better season next time round is certainly going to be wishful thinking. I too have now become a statistic after my dengue antibody test came up with a double positive. The confirmation was after five days of returning home from the hospital when the platelet count took an upward direction. Of course the very first dengue antigen test taken on day one of fever had shown a negative. Now the explanation is that there are several variations (in fact four serotypes – there had been a fifth reported from Malaysia but validation has failed) but the test kit that is available today appears to be failing to detect DENV2 and that means the dominant strain of the virus that is spreading today in Sri Lanka. The amount of clinical waste generated during an episode is enormous as I personally observed. The moment of entry to the hospital premises is marked by injections and the insertion of saline and the continuous testing, etc. adds up. Knowing the poor standards of medical waste management in the country, I shudder to think of the quantities generated from the growing number of admissions. As not even saline is manufactured in the country, my sickness after the close encounter with a mosquito is really adding sickness to the economy as well. The tiny mosquito indeed is formidable. Of course in between bouts of shut-eye – you do not get long spells of that either even at night as the ward nurse will come at 3 a.m. and request you to pass urine and record the volume measurement! – I remembered the statement by Anita Roddick of Body Shop fame on not underestimating the power of small – She famously remarked, “If you think you are too small to have an impact, try going to bed with a mosquito!” I am not sure when my little promiscuous encounter with the mosquito had taken place but one bite did put me out of action for many days and doing nothing cannot be called an experience! I perhaps was lucky as I did not experience about 90% of the stated symptoms but the knowledge that another encounter can be much more problematic is in my mind. Yet what can I do? There lies the second aspect – our ill-discipline. With the 500m radius of the mosquito travel path and the ability to survive dry spells and then to come into life, the Aedes aegypti is showing powers that we have to respect. Until and unless all of us understand the issue and collectively engage ourselves in ensuring the presence of a habitat that would not encourage the proliferation of larvae of this variety along with others, the situation is not going to go away. Certainly the controlling of climate change is beyond us but we can certainly do something about the microclimate. What is more important to realise is history has shown us that June and July are the months to record the highest number of incidences. This year the dengue figure for May had gone higher than the highest for the last year and that certainly is scary as July moves in. The dengue epidemic is aggravated too by the ongoing garbage issue – an issue of our own making. There is no question that we suffer more due to our own neglect and lack of care. The garbage that we do not sort and take care of, but leave out to be collected and placed elsewhere else is providing enough breeding grounds. A little more responsible behaviour from each one of us can dramatically reduce the disease burden. As for the rulers, they too are guilty, as we go from one season to another with no lessons learnt and with limited action. Mobile apps such as Mo-buzz and Veta are available for communication and information exchange and drones too are entering. They sit on app stores and images may reside on memory, while a nation that carries more SIMS than its population has no clue on these. The bacteria that was developed after research in a local research institute and then scaled up for production by a local entrepreneur has been forgotten and today we are looking at another microorganism from down under after talking so much about another similar organism at one point from Cuba! As microorganisms usually do not have national boundaries nor national affiliations, this demonstrates the lack of opportunity for local science and development. Combination of data science, web platforms, apps with mobile communications and then a system of rapid intervention based on data generated from incidences – recorded as hotspots – can quickly tackle issues at source. As my confirmation came after returning home, I am not quite sure that I really was a recorded case and my address a place worthy of some scrutiny! This is what is required today. A hotspot can be when two cases are reported from close proximity. Anyway these definitions can be sorted out and organised action by public health along with environmental police can be quickly meted out when we go ‘smart’ with the singular objective of tackling the issue. There had been so much procrastination on real action – issuing of circulars mosquitoes cannot read has happened with more frequency! – that it is painful see and hear the way the events are turning out to. We once had a newspaper with mosquito repellents impregnated with printing ink – a newspaper where all the letters of all the words were helping Sri Lanka to stop dengue – and we make a big noise about mosquito repellent (mosquito away) TV sets that allow you to watch tele-dramas with comfort. Are we to be satisfied with bouncing off mosquitoes from one place to another? The newspaper was to keep away the mosquito at times when it is most active, coinciding with the usual time for newspaper reading. May be these technologies can be morphed to different devices but for the hype we do not hear of any practical data on efficacy. There is published data on readership and sales of the newspaper gone up but there is certainly no data on dengue incidence having reduced. However one must acknowledge the innovative use of citronella with ink and innovative action is exactly what is required when situations of this nature are developing. This thinking needs to be percolating to minds of the governance class as without consistent and sustained action across a wider frontier Aedes aegypti is going to have time of their lives in Sri Lanka the tropical paradise.